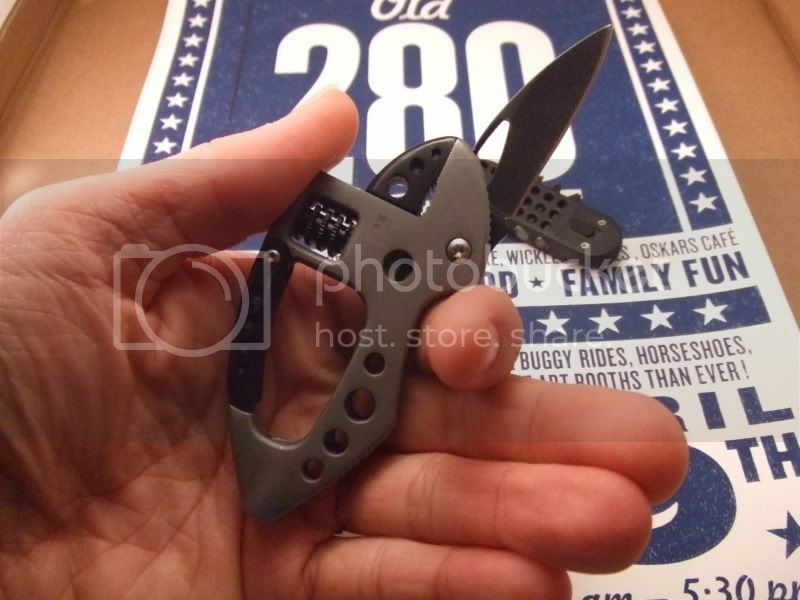 CRKT wrote a new chapter in the book of multitool design with the Guppie. It is based upon an adjustable wrench mechanism with a large carabiner built into the frame. Quality of construction is excellent, despite the reputation sometimes associated with products made in China. Unlike regular adjustable wrenches, the wrench jaws on the Guppie are serrated, like plier jaws. There are fine serrations out to the tip, with a coarse serrated gripping area in near the base. Maximum jaw opening is 3/4 inch (19mm). The intricate frame of the Guppie is cast and cut from a single piece of stainless steel. Finish is bead blast stainless, with a few components given a deep black finish for contrast. The knife blade on the Guppie is 2 inch long (51mm). It features a drop point profile, with a large thumbhole for one hand opening. The knife blade does not lock open. A removable plastic bit carrier is positioned along one side of the tool. It has stations for four 1/4 inch hex bits. In one end there is a high intensity LED light, with slide switch. The bit carrier uses two strong magnets and two close-fitting plastic pegs to remain attached to the side of the Guppie. A pocket clip is secured to the side opposite the bit carrier. A lip on one jaw of the carabiner can be used to open bottle caps and metal jar lids. No sheath is included with the Guppie. In 2009 an all black version of the Guppie will be available. Introduced at the 2007 Shot Show, became generally available later that summer. The Li'l Guppie is basically a scaled down version. Created by Bob. Last Modification: Thursday 21 of April, 2016 22:49:25 CEST by sLaughterMed.